No need for a steady hand for this manicure which can impossibly go wrong. After applying a base color, dip a very thin straw into a different color of nail polish for the splatters. Aim for your nails and blow through the straw! Afterwards, remove the splatterings around your nails with a q-tip and some nail polish remover and you’re done! oh gosh, you are a genius!!! loveeee itttt must try!! These look absolutely amazing! Definitely going to try it. such an amazing idea! will try it out for sure! Amazing! I’m trying it on! Ik vind je blog echt geweldig, en je DIY’s zijn helemaal fantastisch! Heel authentiek allemaal, er zijn weinig bloggers die zo autonoom zijn en dicht bij zichzelf blijven (ipv merkslaven te worden bijvoorbeeld..). Jouw blog is echt van een ander kaliber! Super zeg, miss dat ik het ook eens een keertje ga proberen! genius. May seem like a bit of a strong word for a manicure, but seriously, this is good stuff. Wow thats amazing 🙂 !! Look amazing! 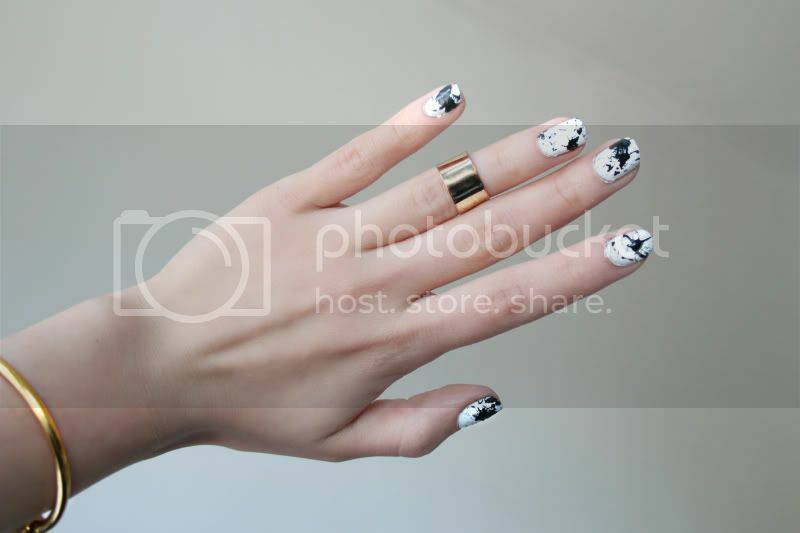 Love this nail art! Pretty impressed with this effect and so simple! love your beauty & diy posts. always learn something new from them. That’s so sweet! perspex, lucite, plexiglass… it´s all basically the same. Maybe you can order it somwhere online? Or maybe your local hardware store can order it for you? (so did mine) You’ll need the cheapest kind; only 2mm thickness. hope this helped! This is awesome, have to try it out! Gahh you’ve done it again! Great idea. This looks so cool! Love it!! very neat. I like it!! That is a great idea for people with unsteady hands. What’s also great is that it will allow me to go up to people and ask them what they see. So I can pretend to be their psychologist. Such an awesome idea! Will have to try it out, looks fantastic. 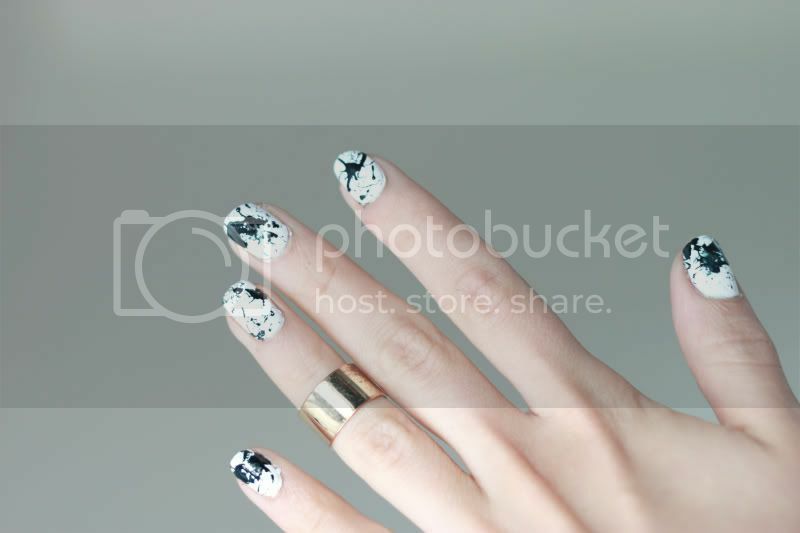 Very beautiful photos… love the nail polish… looks great! Such a great idea. Love the way it looks! Wauw, ontzettend gaaf je nagels zo! I love it, so Jackson Pollack! this looks amazing. i have to try this! Yes i’m going to try this! This is such a great idea!! I must try this out soon! Love it! Thanks for sharing! HOW COOL IS THAT!!! i have to try it! p.s. just discovered your amazing blog…and i freaking love it! again a great idea! thanks deary! Seriously wish I could do this! Will have to plan a day/evening dedicated to it! Really nice! Hope thats ok i borrowed your pics and reblogged this in my blog: bojans.devote.se. I gave you a link offcourse! Love your blog! I love your blog so much you have been a great inspiration http://www.much-carattere.blogspot.com you should come in and check it out and tell me what you think. Please, please! do a video tutorial for this! PLEASEEEEEEEEEE! Nails look great! Lovely ring too. Oh my god I have to try this !! It looks so amazing and I try it, but I don’t know where I can buy so thin straws. Where have you buy these thin straws? Slide a hose clamp over the thin end of the beer hose.Push the thin end of the beer line over the barbed end of the shank.This might take a while but make sure to slide it on completely.Twist the wire back and forth to help it slide easier.Slide the clamp over the end of the hose and shank.Squeeze firmly to tighten. 3 tablespoons instant nonfat milk powder Most models today are very easy to use, all you need is a filter, some coffee, and running water. The only wy you can lose suction with the Rainbow, is if you have one of the latst models, the E-Series. Drying time will depend on how thick your meat is cut. time to be happy. I’ve read this post and if I could I want to suggest you few interesting things or advice. Maybe you could write next articles referring to this article. I wish to read more things about it! daily, this web page is actually good and the users are in fact sharing good thoughts. songs current at this website is in fact superb.